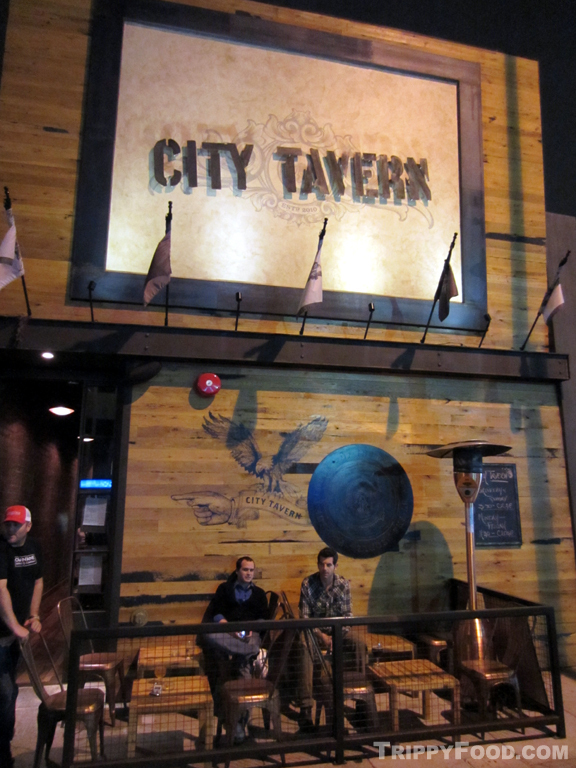 Those of you expecting Culver City's City Tavern to resemble the kind of place Paul Revere may have stopped in for a pint of ale may be disappointed, although to their credit, the space looks like someone reassembled an old tavern inside a modern building; in fact, the wood used in the flooring and paneled walls is reclaimed, giving the relatively new watering hole a rustic look. By night, yellowy lighting gives the bar area the appearance of a faded Polaroid, and the only thing that reminds you you're in the 21st century is the computerized Table Tap system in the back booths. 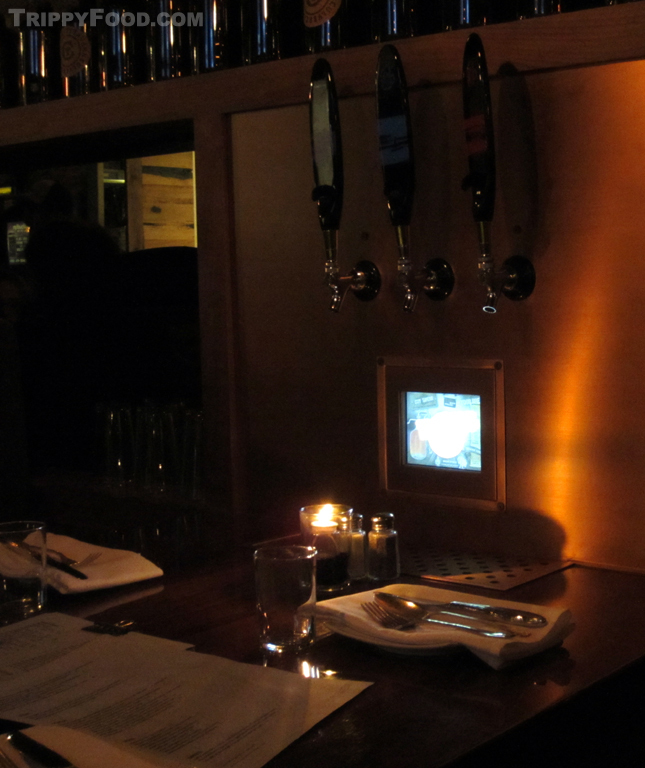 If the beer taps mounted on the booth wall confuse you, a tiny video screen in the vicinity of your splashing suds displays in graphical Technicolor how much brew you're pouring - you only pay for what you pour, so if half a glass suits your fancy, have at it and save the change for cab fare. The featured beer and ales are changed out seasonally; currently each booth features Ventura, California's Surf Brewery's Mondo’s Cream Ale, Shaka XPA, and Surfer’s Point Vienna Lager. Of course like any reputable tavern, City Tavern has a list of commercial and craft beers available as long as the ride from Boston to Lexington. Draft, can, bottle - take your pick. They can probably set you up with a can of PBR if that's your poison. On my visit the bar was highlighting beers from local brewer Cismontane; our hostess was gracious enough to pair small glasses with some of the menu items. 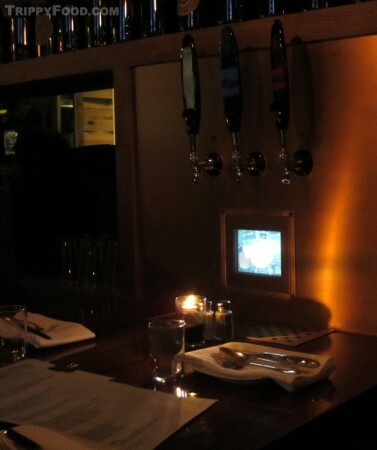 Although there are paper menus from which to select your food, the menu is also handwritten in chalk on the ceiling-to-floor slate wall beside the bar (similar drink items are chalked into the panels that run around the ceiling level below the exposed beams - they obviously hire Michelangelo to change the specials). Most of the plates at City Tavern are tapas-style (shareable), although there are a few items from the Held portion of the menu (such as their burgers and ***gasp*** grilled cheese). Our group started with the South Park-themed cheesy poofs; I was expecting something akin to Cheetos, but as light as these fried Queso Manchego worms were they weren't like eating cheese-flavored air and my fingers didn't turn orange. Their poutine was far from authentic, but it was packed with flavor - the fries were seasoned and topped with bits of braised short rib and au jus which melted pimento cheese into the stack to give the whole mess a flavor reminiscent of chili cheese fries. A burrata cheese dish came dressed in butternut squash and pumpkin seeds; although the seeds added a nice texture to the otherwise creamy consistency both the cheese and squash flavors were a bit on the mild side. There seemed to be an abundance of fresh figs - a salad featuring Asian pear slices over spring greens was drizzled with house-made fig vinaigrette; other dishes came garnished with fig. The meatballs were a bit of an oddity - although not completely denuded, they were dipped in a light creamy sauce rather than a tomato-based one. Ordering the more substantial fare directly of the menu bears a certain element of surprise. Ordering the shrimp and grits conjures the image of a mound of creamy, cheesy grits topped with grilled shrimp worthy of a Charleston low country bistro, but what arrives at the table makes you wonder if the laws of physics truly do cease to exist on top of City Tavern's stove. After cooking the grits, they're chilled in a pan and cut into bars, which are then deep-fried to crispy dark brown blocks resembling fish sticks in appearance and texture. 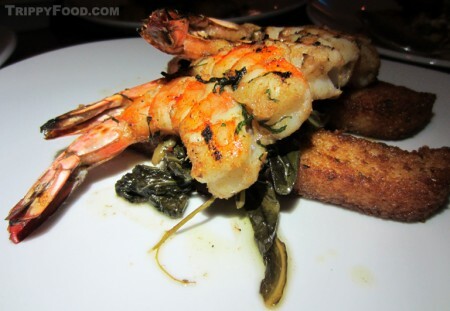 These are Jengoed on the plate and draped in wilted collard greens with a gang of grilled shrimp laid to rest on top. 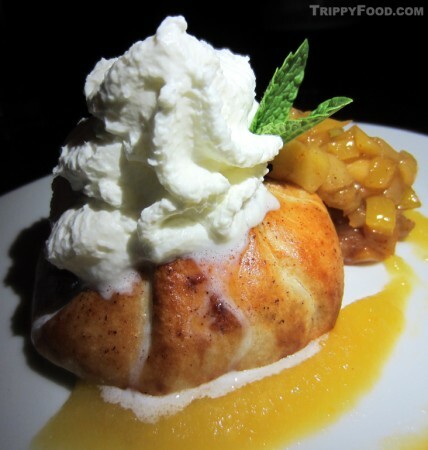 The presentation makes it a little more work to manage a forkful representing each ingredient, but the fruit of the labor is worth every bite. There are multiple fish dishes available and each is assembled creatively in the kitchen; one rarity on most menus is the skate. For anyone who has had the pleasure of dining on skate wings, the light, soft flesh is wrapped around bony fingers of cartilage, resulting in an experience somewhere between working spare ribs off the bone and eating your way around the sinews and tendons in a turkey leg. 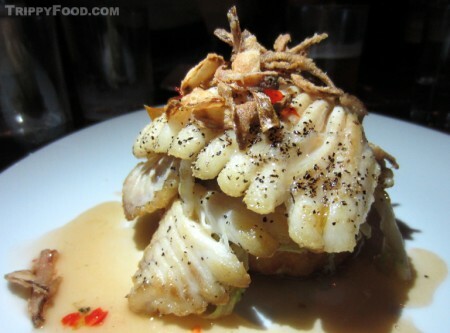 At City Tavern, the cartilage is removed resulting in a blanket of meat that is folded onto the plate; the fish simply melts away with virtually no texture. The roasted opah we sampled was flaky but a tad dry although the presentation was museum quality - the complex structure of segmented baby artichokes held the fish aloft, with the opah crowned with a couple of slices of fresh fig, truly a sight to behold. This entry was posted in Southern California and tagged apple tart, Asian pear, burrata, CA, California, Carmela ice cream, cheesebutternut squash, cheesy poofs, chocolate tart, Cismontane, City Tavern, Culver City, fig, fried chicken, fried green tomato, Mondo’s Cream Ale, opah, poutine, pumpkin seeds, salmon, salted caramel, Shaka XPA, shrimp and grits, skate, Surf Brewery, Surfer’s Point Vienna Lager, Table Tap. Bookmark the permalink.